A simple goal, to directly connect Emacs to running hardware and software synthesisers with realtime control. Emacs as a musical instrument. I already use code to control synths (as Repl-Electric) but there is a level of indirection between the code and the effect on the music. You push keys on your computer keyboard and nothing happens. Only when you run the code does the music change. I wanted to add realtime control to my performances while still remaining in code and Emacs. Bringing the performance closer to musical instruments were instant feedback is a core part of the performance experience. 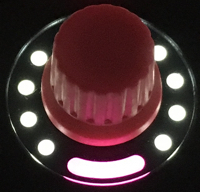 I could use external hardware, like a MidiFighterTwister (https://www.midifighter.com/#Twister) or TouchOSC (https://hexler.net/software/touchosc) but I’ve found the context switch of moving between coding to twiddling dials on hardware expensive. The code is my composition process, so it makes sense for the direct control to also be there. Sculpting sound live with Emacs. 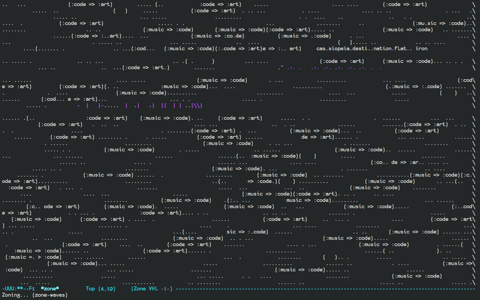 Doing crazy things with Emacs starts to open more doors in musical expression. Since we can control music hardware with Emacs, we can control the playhead position within a sample. Much like the needle of a record player. Say we map the position of your cursor in the Emacs buffer to the position of the playback head. By moving around in your buffer you can scratch the sample. Sending messages to musical synths using midi and OSC. A lot of musical hardware and software only supports midi. We are sending OSC 😕. Hence we need a quick way of converting our OSC message to a midi message. Why don’t you send midi from Emacs directly? It’s not a new thought (https://www.emacswiki.org/emacs/EmacsMidi), but I’ve seen no examples of getting it working. My answer here is path of least resistance, and I don’t feel like implementing the midi standard in Elisp. Luis Lloret (https://github.com/llloret) has create the lovely C++ lib osmid (https://github.com/llloret/osmid) for converting between midi and OSC. And its FAST. We launch the o2m server in a shell which will be listening on port 4561 and will forward on OSC messages as midi. Midi has a fixed argument format while OSC is very flexible. Hence this a little jiggery pokery in get the source OSC message mapping to the midi arguments. For MIDI_HOST I’m using the Inter-application communication (IAC) driver on Mac. This registers IAC Bus 1 as a midi device. I’m also sending a control change message, shaping the parameters rather than triggering notes. This could be any of the supported midi messages (note_on, note_off, pitch_bend, poly_pressure, etc). The channel 9 and control code 100 seem magical. I’m routing those to synths via Ableton Live. Any DAW would support this or you could send direct to a synth and not use IAC. Your MIDI_HOST would be the name your midi device registers as. We have the backend for sending live midi controls to hardware. Now we need some interface within Emacs to trigger it. The design is based on the idea of dial encoders commonly found in music hardware. Our dials in code are float numbers. To turn our dials we borrow the idea from the Chrome inspector of scrolling through possible numeric values with the arrow keys. In our case every increment/decrement will send a live message to our synths. Here comes a lot of Elisp and some hairy regexes. Thingatpt (https://www.emacswiki.org/emacs/ThingAtPoint) which is part of the standard lib is extremely useful here. float and if so change it with `fn-float-op`. "Increase a float value and send OSC message." "Decrease a float value and send OSC message." We map our synth-and-param to the correct midi port and channel. We are almost done. For fun I’ve added a visually aid to the position of the float encoder. Midi messages are generally limited to 0-127 values, so if we map that to 0-100% we can create a visual representation of the current setting. "Add a ASCII encoder bar to anything that looks like a tweakable float"
"Update ASCII encoder bar for float being changed"
I’m using Emacs to simultaneous control Synths and Unity3D in much the same way discussed in this post. It feels pretty amazing to augment the performance with this live control. Exploring patterns as a means of documenting Clojure functions to aid recall and understanding. Whats the difference in Clojure between: partition and partition-all? interpose and interleave? cons and conj? All non-side effecting functions create or alter a pattern. To explain a function’s pattern we use a number of descriptions. Clojure has a strong focus on REPL driven development. If you don’t understand a function use an interactive REPL to explore examples. Critically this favours discovery over recall. I can never remember the difference between conj and cons, but I can find out through the REPL. To help aid memory and understanding I’ve turn the examples of the collection orientated functions in Clojure into visual patterns. I won’t try and make any general case on visuals vs text (Its a fuzzy research area: http://studiokayama.com/text-vs-visuals/). Returns a lazy sequence of lists of n items each, at offsets step apart. If step is not supplied, defaults to n, i.e. the partitions do not overlap. return a partition with less than n items. with any elements = a key in smap replaced with the corresponding val in smap. Return a random permutation of coll. Returns a lazy seq of every nth item in coll. As someone who performs live coding to an audience I perhaps have a different value on recall vs exploration. Hundreds of eyes staring at you tends to have that effect. While some examples are stronger through patterns than others, at least for myself the use of a visual aid as part of development and documentation is beneficial. Its the only way I can the remember the oddity of conj. Within my REPL interaction I use the functions-as-patterns toolkit, providing a higher level representation of the patterns and data. I can understand a drum pattern faster through colour than I can through a 1 & 0 data structure. In creating the cheatsheet the value of the comparison of functions through patterns also became clear. I discovered almost identical functions such as nthnext and nthrest which only differed in a special case (with an empty sequence). I’ve not tried to visually represent, empty or nil. Some functions are defined by the difference in handling the empty case. The patterns might mis-lead you to think nthnext and nthrest are identical when they are not. What type is a square? Clojure has multiple types of sequences, char-arrays, lists, vectors, lazy-seq ,etc. To keep the visual pattern simple I’ve not represented these types. I’ve purposely skipped the map/reduce/remove/filter functions as they tend to mix two patterns together. That of the core function and the applied function. The value of the patterns gets lost. Do you see a pattern in the randomness? A single example might reveal a false pattern. Many examples would be required to re-enforce the randomness of the resulting patterns. Example shuffle. Colours don’t always imply a logical order. Example sort. Procedurally generating music, scoring generations based on an audio service (like SoundCloud) identifying it as an existing song/artist. The more famous the track/artist the better. Reduce the audio features to their essence (facilitating fast lookup or accuracy on a sliding scale). Rely on computer vision techniques to create audio fingerprints. Account for differing audio quality and ambient background noise. Use a training set of sane music to teach the algorithm to recognise music. We use these propeties to guide us in creating new music for machines that explores the smudged edges around machine listening. Highlighting how differently humans and machines identify music. And for fun. All generated tracks have comments exactly when a song was detected. While I experimented with lots of different services the above examples were most successful when using Shazam for identification. This focuses on operating in noisy environments and identifying a sound as quickly as possible based only on partial song information. This tolerance makes it easy to get Shazam to mis-match audio to songs. The other services also had a nasty habit of banning new accounts uploading what appeared to be copyrighted infringing content (who would have thought!). Which makes the whole mass procedural generation somewhat challenging. Shazam has a desktop app which will run detection on audio for 8 hours continuously. So over that time we generate a large set of audio and pick the winners from each generation. The various properties of the audio units are selected randomly. Running for 3 minutes with a random chance of mutation to score and parameters. Each generation scored based on number of Shazam matches (scraped from Notification alerts on OS X). Each generation scored by popularity of artists matched (manually ). Soundflower output device -> Shazam Desktop. There is a clear difference in the strength of accuracy when it comes to fingerprinting audio for copyright infringement. It’s noticeable that Soundcloud or YouTube are matching when processing the entire track (even though it will check for partial matches) while Shazam focuses on as small a segment as possible LIVE. Open-source alternatives (like Chromaprint) while useful, provided little help tricking the commercial services. Coming back to Shazam, what actually made the tracks match remains somewhat of a mystery. If we look at one example “Michael Jackson - You Are Not Alone” our generative score was not even in the same scale or tempo! We can identify things that made it hard to match, for example adding drums patterns killed off all matches. More layers of audio, more permutations to explore. One thing is clear, the way machines learn and the specialisation on a single application rules out a whole subset of sound that is unlikely to enter the realm of music. Hence for the creators of the algorithms, a mismatch of this type is of little relevance. This lost ghost music is perhaps just for the machines. To bring OpenGl to Clojure I use Shadertone written by rogerallen. This utilises LWJGL (Java Light Weight Java Game Library https://www.lwjgl.org). 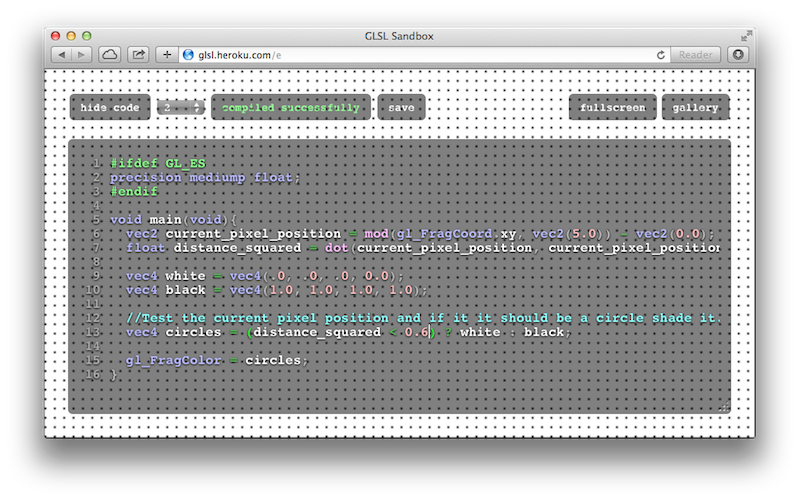 A vital feature of Shadertone is a map between Clojure atoms and shader Uniforms. What is a shader Uniform? Well think of it as a read-only global variable in your shader. A Clojure watcher ensures any updates to your Clojure atom persist into your Uniform. A little clunky but all uniforms start with the letter i.
;;iExample Uniform will also be updated. When a shader file is edited Shadertone is watching the file (using watchtower) and will reload/recompile the changed file. This results in a slight freeze as the new code is run (This might be down to my graphics card). Hence most of the time I prefer alternatives to live editing the shader to create smoother transitions. To make static images move we need a continuously changing value. //Use the continuously changing time signal as the value for a color. Putting a continuously changing value through a function like sin/cos is the bread and butter of creating animations with shaders. We often need a cheap and fast way to generate random floats in Shaders. Without persistent state and preservation of a seed it can be difficult. One solution is to use a noise image and the current pixel coordinates as an index into the image for a float value. //Turning the current pixel coordinates (uv) into a random float. I attach a weight to each function or visual phase of the shader. Through this we can select which visual effect is visible or combine multiple effects. Its a bit messy, since I have all my functions in a single shader file. I’ve not explored including of external files with shaders. Shadertone uses the seconds since start (iGlobalTime) while Overtone via Supercollider uses the soundcard’s clock. Hence there is no guarantee these two sources will be in sync. Replacing iGlobalTime is the only option. We create a special synth called data-probes which sole function is to transfer data from the Supercollider world to the Clojure world. Overtone provides a Supercollider to Clojure binding called a tap. We add a tap into our Overtone synth which is polling our global timing signal (this powers all synths and is how we co-ordinate everything). Using our iGlobalBeatCount in our shader now means anything requiring a continuously increasing value flows to our beat. Persistent mutable state between executions is not possible in OpenGL Shaders. Uniforms are read-only. The current value based on the global clock is passed into the Shader as the iBeat Uniform. My solution is to move to Clojure where mutable state using atoms is simple. Our timing is guided by Supercollider and a global clock. The value of our kick buffer at anyone time is only known inside the synth and hence inside Supercollider. But if we want to have mutable state we need access to this value in Clojure. So we create a custom synth that taps the value of the kick buffer based on the global clock signal. Now in the Clojure world its simple to watch our tap atom and hence get alerted when it changes value. Overtone is dealing with the magic of updating the atom under the covers, the watcher is a nice implementation independent way of hooking into this. We now know the value of our kick buffer in Clojure. If we use another atom as our accumulator we can update it when the tap atom changes. Finally pushing this new accumulator to the Shader. Thats a lot of work, but I’m very happy with the results in my (end-of-buffer) performance. Writing to a buffer is a common way of live coding in Overtone. Its very useful to attach some visual effect based on the settings of a buffer. We could put a tap into the synth and grab the current note and pass this into the shader. As I’ve mentioned taps are expensive and they are always on while we may not always be using them. This also gets more complicated when say we have 3 instances of the same synth running playing simultaneous to form a chord. An alternative is to invent an atom which is used as a signal on every buffer write. I use this trick in (end-of-buffer) to use the bass note to control the level of distortion of the visuals (source). Its wonderful to focus on the notes and feel the visuals following you automatically. I often want to map a midi note to a visual effect. All my notes are mapped to buffers. Much like we did with the drums I can use a tap to get access to the current note being played in a buffer. Skipping over the details, when we have a midi note we send it as an float (to support crazy 42.333 like notes) to the shader via an atom. A cheap way to scale effects based on the height of the note. Often I want a smooth fading it or out of a shader function. Say for example fading to black. Pretty simple, just fire a thread which sleeps and ticks an atom. The atom is fed into the Shader. 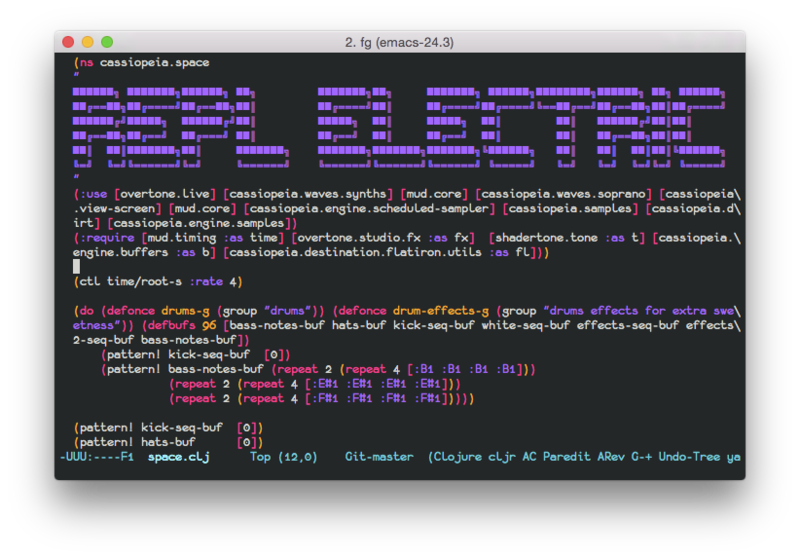 In end-of-buffer I spell the word Repl Electric out of floating lights. We are bound to only a few data structures with fragment Shaders. I used a simple 3x3 matrix mapping each part of a character. Then using this to decided the position of the lights. Shadertone provides a 2x512 array with the frequency spectrum (FFT) and audio waveform data. It does this by loading the data into a 2D Texture. The audio data is taken from tapping the main Overtone audio bus. It’s always a challenge to utilise this without creating something jerky or causing motion sickness. Hence I tend to use the waveform or FFT as a distorter rather than a base for animations. It also helps to concentrate on specific ranges of frequencies of the waveform data to create a stronger connection between a synth and the visuals. //uv.xy => current x,y coordinates of pixel. //First argument is an index into the 512 values of the waveform. //By limiting the first argument we can ignore certain ranges. 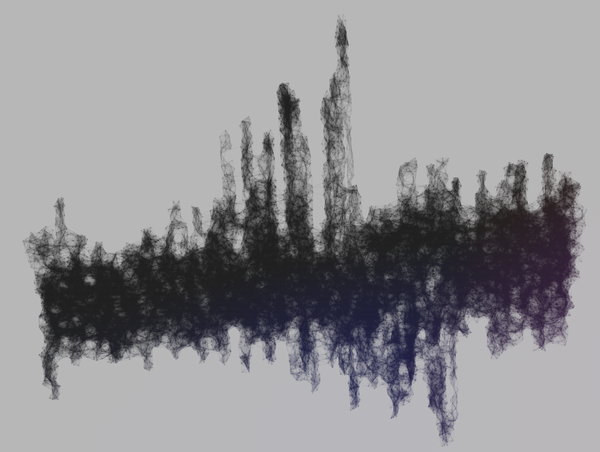 Here is an example where I use the audio waveform to distort the scale & jaggedness of a series of circle shapes. //moves along, examining a different part of the audio wave. 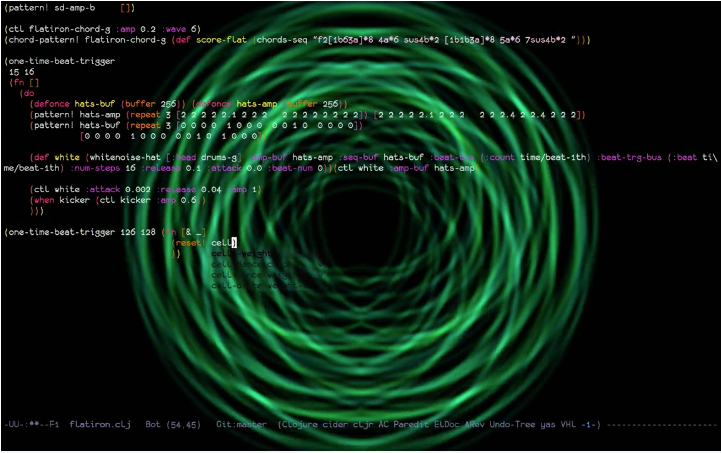 Through Clojure’s binding of atoms with Fragment shaders we have the power to live code visuals and music. Though it comes at a cost of complexity having to wrap lots of functions in order to have powerfully connected visuals. Fragment shaders are extremely terse, and can be pushed to replicate many advanced effects but they are also performance intense, and often taking a non-shader route will be much more performant. My knowledge of LWJGL is small, but crashes in the fragment shaders often occur leaving the JVM wedged. This has happened to me quite a lot practicing, but never in a performance. Its worth reflecting that something (be it fixable) leaves a risk of a freeze in a performance. I’ve started to explore what a shader application might look like if it was a server and provided a state machine so the live coding language does have this complexity. In turn producing a freer and more spontaneous interaction. This project is Shaderview and steals all the good ideas of Shadertone while adding some new features like vertex shader art. I’ll be writing up more about Shaderview soon. Emacs is designed for fast, highly customisable manipulation of text. 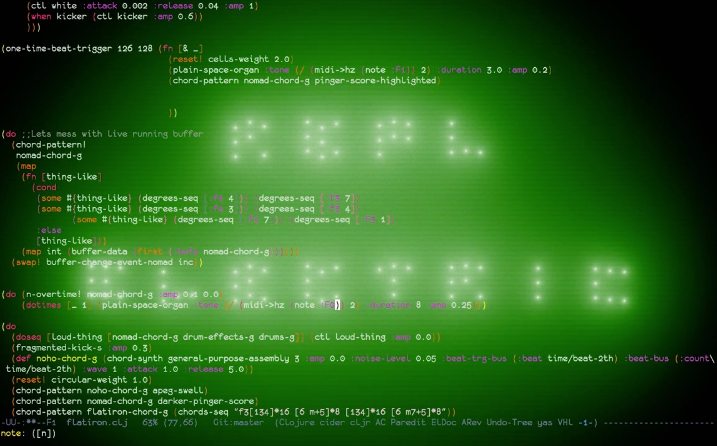 ASCII animation requires manipulating text at a sufficient speed that it appears animated. Emacs is also used by a number of performers to live code musical & visual performances (and many other things). 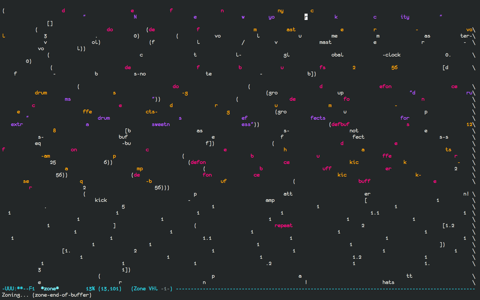 Where the audience can see the code in emacs and hear it. In my live coding performances as Repl Electric I’ve used emacs animations to augment emacs with more feedback for the performer and a chance to destroy the order and structure the programmer has spent the entire performance building. Reminding us that we are looking at thoughts expressed through code that seem magical but are ultimately nothing more than text. Maybe something akin to the creation and destruction of Sand Mandalas. Zone Mode is an Emacs plugin which provides a framework for screensaver like animations. A nice property of taking our buffer as input is we are never quite sure what text will be there and hence the properties of the animation. A simple function that finds non-whitespace in the buffer and tries to uppercase the char. It knows nothing about the zoning framework, its just a plain old function that operates on the active buffer. We can override all other zoning programs and just specify our zone-fn. When we activate zoning our animation will be run. OSC is a handy protocol for sending data between networked devices using url like endpoints. Emacs has a plugin to run an OSC server (http://delysid.org/emacs/osc.html). Hence if we have some kind of beat signal we could send a message to Emacs and in turn it could render changes based on our musics timing. "Create an OSC server and bind our fallback functions"
Heres a little demo with the brackets and window number changing colour based on the Overtone beat. Given some small local lag we now have a timing signal which is threaded through all our tools. 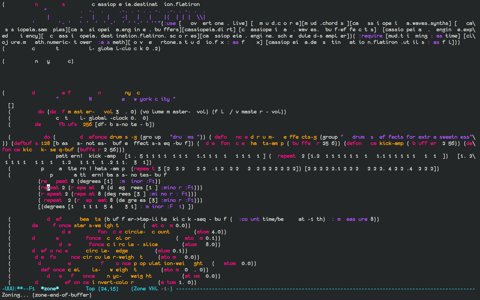 Supercollider, Overtone and Emacs. 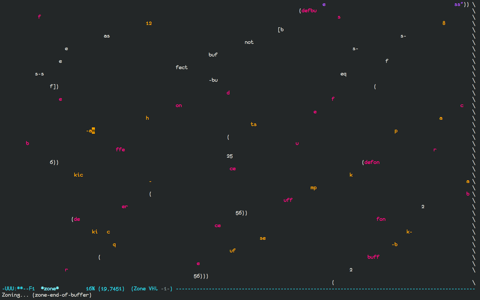 Now that we have ways to animate and to connect audio data with emacs we can go a little further (way too far) and start to visualise the data about our sound in ASCII. From Overtone or SuperCollider we can create a synth which tracks the peak and power of an audio signal. It sends us messages back with the data which we then forward on as OSC messages to Emacs. 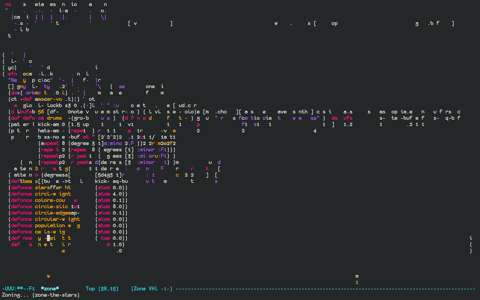 All my Emacs animations are used to conclude the performance. Heres lies the source code, some screenshots and tricks & tips that made the animations possible. In this animations the text gets slowly broken up with white spaces and then like the wind, blows the characters away. Sometimes words are ripped apart as they blow in the wind (if we get lucky). Injection of spaces. This starts to distort the text while keeping it readable. It provides a way to increase the effect of expanding whitespace in the next stage. Transforming whitespace into lots of whitespace. A Regex matches whitespace and replaces it with a randomly increasing amount of whitespace. Which leads to the effect of the characters of the code blowing away. I spent a while trying to improve the speed of this phase and Regexs proved to be the fastest way. If we move the text fast enough soft word wrapping means the text appears to re-enter from the left side of the screen and eventually disappear out of the buffer. 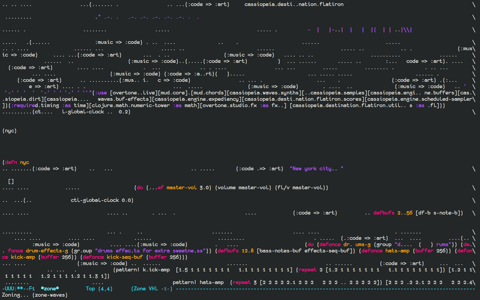 Without soft wrapping we get a horrible jitter as emacs moves back and forth between left and right side of the buffer. Continually incrementing integer. Useful for injecting movement or using sin/cos fn with a continuous value. Perserving the syntax highlighting of the original code in an attempt to maintain some of the meaning of the code. This was my first animation and was based heavily on zone-pgm-drip-fretfully. It randomly picks a single character and moves it down the screen until it hits another letter or exits the screen. When running Emacs + Overtone + OpenGL, Emacs starts to slow down so part of the challenge was ensuring the animation ran as fast as possible. A nice property of this is that as the OpenGL shaders shutdown, the speed of the animation increases and the code destroys itself more quickly. This animations attempts to simulate the effect of waves using line wrapping and mixing deletions with insertions of different sizes to create lines that seem to move at different speeds. While it may seem silly to bend Emacs to do things it was never intended to do, it’s an important part of discovering for yourself how you want your tools to work. Not just doing what you are expected but breaking them apart and discovering for yourself how you want to use them. I’ve been working over the last year in the data team at SoundCloud building a realtime data pipeline using Clojure and Amazon’s Kinesis. Kinesis is Amazons equivalent to Kafka, “Real-Time data processing on the Cloud”. This is a summary of what was built, some lessons learnt and all the details in-between. The first step was to tee the traffic from a live system to a test system without comprising its function. The main function of the live system is logging JSON events to file (which eventually end up somewhere like HDFS). Tailing the logs of the live system gives us access to the raw data we want to forward on to our test system. A little Go watches the logs, parses out the data and then forwards them in batch to test instances that will push to kinesis. Hence we had live data flowing through the system and after launch a test setup to experiment with. Sean Braithwaite was the mastermind behind this little bit of magic. All kinesis sending happens in an application called the EventGateway (also written in Clojure). This endpoint is one of the heaviestly loaded services in SoundCloud (at points it has more traffic than the rest of SoundCloud combined). The Eventgateway does a couple of things but at its core it validates and broadcasts JSON messages. Hence this is where our Kinesis client slots in. Its worth mentioning that in order for the Eventgateway service to be performant we had to remove all reflection in tight loops through type hints. It simply could not keep up without this. It became a common pattern to turn reflection warnings on while working in Clojure. 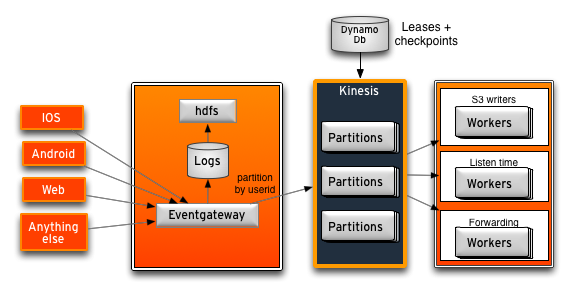 The Eventgateway posts to Kinesis in batch using a ConcurrentLinkedQueue and separate producers and consumers. Messages are pushed into a ConcurrentLinkedQueue. We rolled our own Clojure kinesis client using Amazons Java library rather than using Amazonica. Amazonica did not support batch mode for Kinesis. Under initial tests it was impossible to scale this without batch. Injecting our own telemetry at low levels to learn more about Kinesis running. Some of its sensible defaults where not so sensible (for example default encoding the data using nippy). 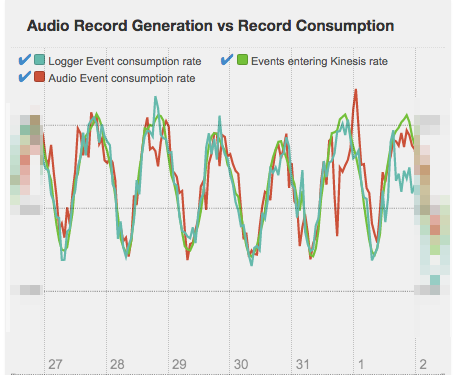 Ultimately most of any Kinesis client/server is configuration and tuning. Amazonica’s source is hard to read with a little too much alter-var-root going on. ;;Ugh. Its not just me right? Very simple, just adding a message to the ConcurrentLinkedQueue. A environment variable allows us to gradually scale up or down the percentage of traffic that is added to the queue. Not exceeding memory limits with a hard queue size (since ConcurrentLinkedQueue is unbound in size). Backing off workers if the queue is full to prevent cpu throttling. When we cannot send messages to kinesis we instead log them to disk, and into our normal logging pipeline (usually ending up in HDFS). Hence we coule replay at a later date if required. When polling from the queue an exponential back-off if no messages are on the queue. "Exponential backoff with jitter and a max "
Once the batch is ready (in terms of age or size) its sent to Kinesis. returns a list of events that failed." Note this is where we also decided the partition key. In our case its important for the same user to be located on the same partition. For example when consuming from Kinesis a worker is allocated a partition to work from and would miss events if they where across multiple partitions. "Take client and a vector of JsonNodes and produce a PutRecord"
Failure can occur on individual records within a batch or in the batch as a whole. These messages are re-added to the queue so we can try again. If the messages fail for some nth time they are considered invalid and rejected from kinesis and logged as an error. Amazon had an Internal Failure. We don’t know what went wrong. (We see this regularly in normal function). Amazon Kinesis is not resolvable (AmazonClientException/AmazonServiceException). Exceeding the read/write limits of Kinesis (ProvisionedThroughputExceededException). Forwarding certain messages on to various other systems (like RabbitMQ). 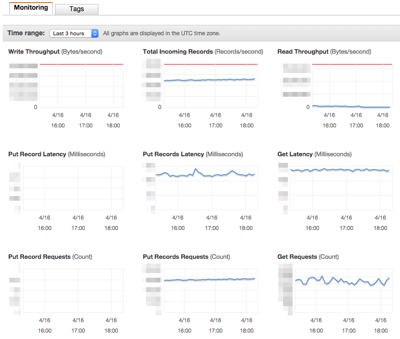 Launching a worker is pretty simple with the Amazon Java Kinesis library. One of the hardest parts of setting up the a worker is getting the configuration right to ensure that the consumers are getting through the events fast enough. Events are held in Amazon for 24 hours after entry, and hence there is a minimum consumption rate. 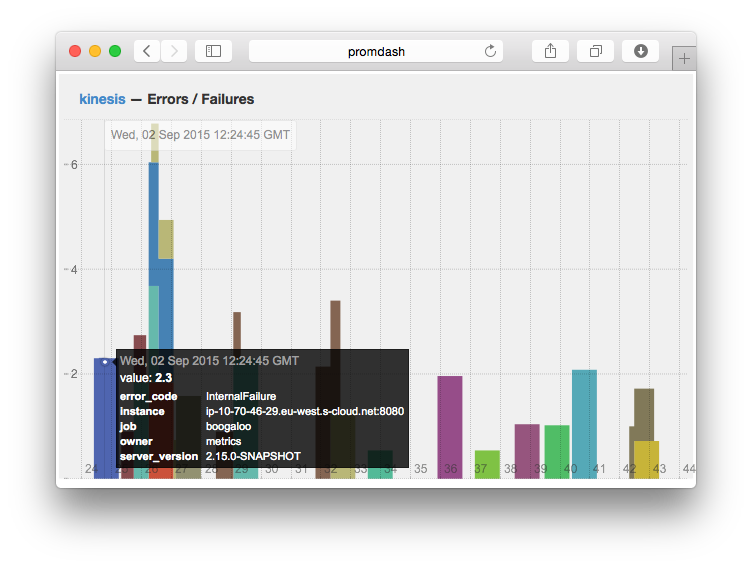 Counting events in and events out with Prometheus made it easier to get the correct consumption rates. Finally you can also look at Amazon’s Dynamodb instance for the Kinesis stream providing insight into metrics around leases, how many where revoked, stolen, never finished, etc. Here is an example of one of our Kinesis workers configuration covered in scribblings of me trying to work out the right settings. ;;other workers take over processing of that shard. ;;will keep stealing each others leases producing a lot of contention. ;;Process records even if GetRecords returned an empty record list. ;;or we encounter an exception. ;;By default, the KCL begins withs the most recently added record. ;;Instead always reads data from the beginning of the stream. Prometheus (http://prometheus.io/) a monitoring tool built at SoundCloud was core to developing, scaling and monitoring all of this pipeline. Amazon does provide some useful graphs within the AWS console but more detailed feedback was very helpful even if it was removed later. This work constitues a team effort by the Data team at SoundCloud. A lot of advice, collaboration and hard work. Kudos to everyone. Using Clojure we create interesting 3D shapes in Minecraft to the beat of music generated from Overtone. We achieve this by embedding a Clojure REPL inside a Java Minecraft server which loads Overtone and connects to an external Supercollider instance (What Overtone uses for sound). We need to install Spigot which is an optimized version of the Craftbukkit Java Minecraft server and install clj-minecraft project as a plugin. Things are complicated by Bukkit no longer being registered in Maven. Bukkit + clj-minecraft will be installed for you. Select >“Multiplayer” >“Direct connect” and enter the “Server Address” as localhost. $ sudo find /. -name "scsynth"
clj-minecraft opens a REPL on localhost port 4005. Using emacs and cider connect to this REPL instance. Using MUD we have some useful wrappers around Overtone for scheduling functions on beats. To coordinate graphics and sound we schedule both within a single function. Most functions that change the state of the Minecraft world need to be run in the main GUI thread. To achieve this we wrap any state changing function within ui-sync (https://github.com/CmdrDats/clj-minecraft/blob/a3331e925b56becf88d9ef96cab225856e2f7ead/src/cljminecraft/bukkit.clj#L39-L42). Create, play and share all the crazy things you can come up with using Clojure and Minecraft. Built on the back of lots of great open source projects. 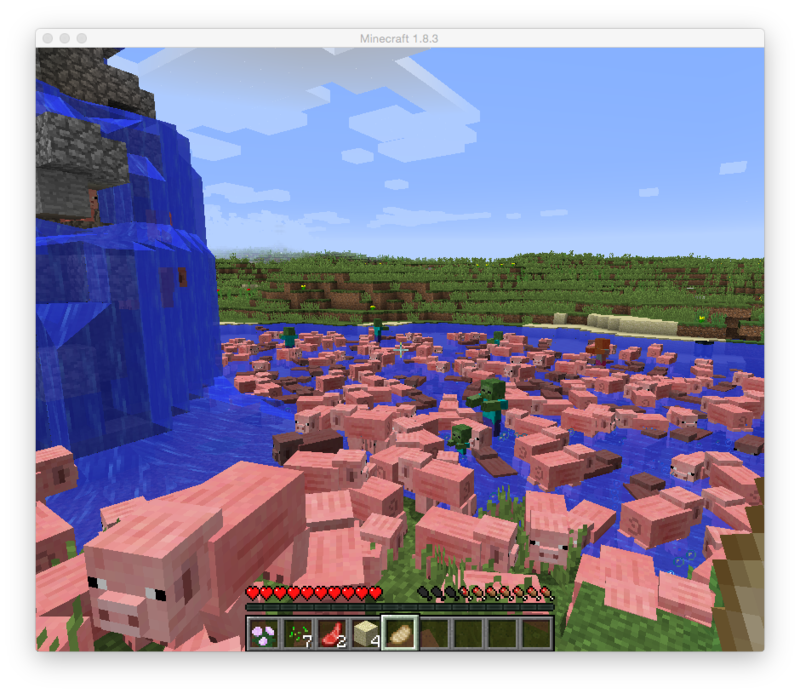 Thanks to the Craftbukkit/Spigot contributors, @CmdrDats for clj-minecraft and @samaaron for Overtone and inspiring this crazy journey with the musical Sonic Pi (which supports combining music and Minecraft on the RaspberryPi). Live coding is the act of turning a programming session into a performance. This can constitute improvisation, music, visuals, poetry, hardware, robots, dance, textiles and people. Pretty much anything with an input and output can be controlled live by programming. This is not just a performance by programmers for programmers. While this is often where it starts as a live coder, the type of audience and the accessibility of the performance lies in the performers imagination. Abstraction can get us pretty much anywhere. Repl Electric is a project I started in order to discover more about music composition and Artificial intelligent based aids to creativity. Which in turn through the inspiration of people like Meta-ex lead me to live programming music. Clojure is a LISP language based on the JVM. 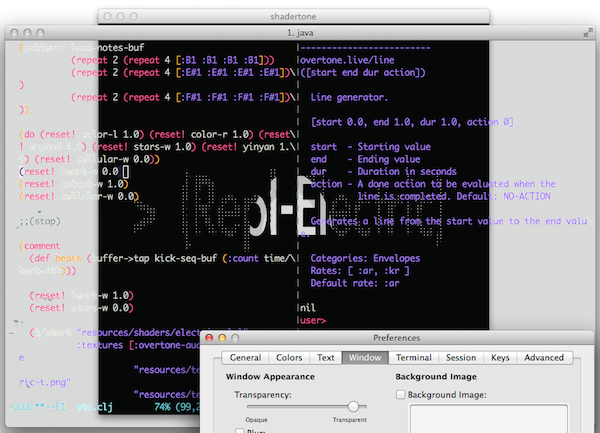 Clojure focuses on interactive REPL (Read, Evaluate, Print & Loop) driven development. Which makes it a good choice for interactively coding music. It also turns out functional programming is a good fit for operating over music as data. Emacs live is a Emacs release with packages and defaults that are Live Coding centric. Something I use for both for my work and for my live coding. To execute our code, we launch a repl instance in our project (NEVER launch inside emacs, since then if emacs crashes the repl and music dies) and connect to it from emacs using cider https://github.com/clojure-emacs/cider. A simple trick to combine Emacs code and visualizations is to launch an OpenGL window in full screen (see Shadertone) and then put a full screen transparent terminal window running emacs over it. Overtone is a Clojure based client to SuperCollider. Supercollider is an environment for real time audio synthesis and algorithmic composition. Timing (beat generation – example timing code). Running samples (both your own and from Freesound). Live Synth control (changing notes, durations, reverb, etc). Hardware interaction (through midi or OSC). Timing is a complicated issue but so important its worth touching on. You have a choice with Overtone to use Java for timing or Supercollider. I use Supercollider since I have found it to be much more reliable. Everything you need is here (copy and paste), thanks to the hard work of Sam Aaron. The key concept to take away is there are two types of timing, a beat counter which is forever incrementing and a beat trigger which flips back and forth between 1/0. The counter is useful for indexing buffers, the trigger is useful in controlling the gate of an envelope (which turns a sound on or off). I use this extensively to time graphic transitions with the music. Most of my live coding performance was writing to buffers which are hooked into synths. Buffers are just fixed size arrays but they are stored in Supercollider rather than in Clojure. Here is an example from The Stars where the midi notes are read from a buffer at a rate based on my beat timing signal (a 16th of the main beat here). //Test the current pixel position and if it should be a circle shade it. To synchronize the graphics with the music I created a special Overtone synth which does not generate any sound, it instead feeds information in realtime to my shader. ;;A synth that exposes through taps all the lovely timing information. The other main way of controlling a shader from Clojure is using atoms. Something you don’t see in the video is that I’m using a 8x16 Monome. For this performance its primary function was a visual aid to show the beat/measure information. 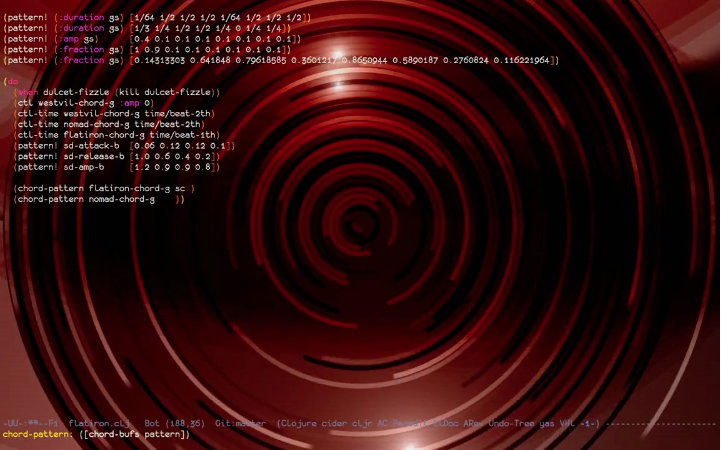 Live coding music and graphics combines skills in sound engineering, 3d graphics, geometry, physics, musical theory, composition, improvisation & hardware to name a few. It is difficult, and requires a lot of work and practice. But of all the code I’ve written over the years this is one of the things I’m most proud of. And i’m only at the beginning of discovering what’s possible. 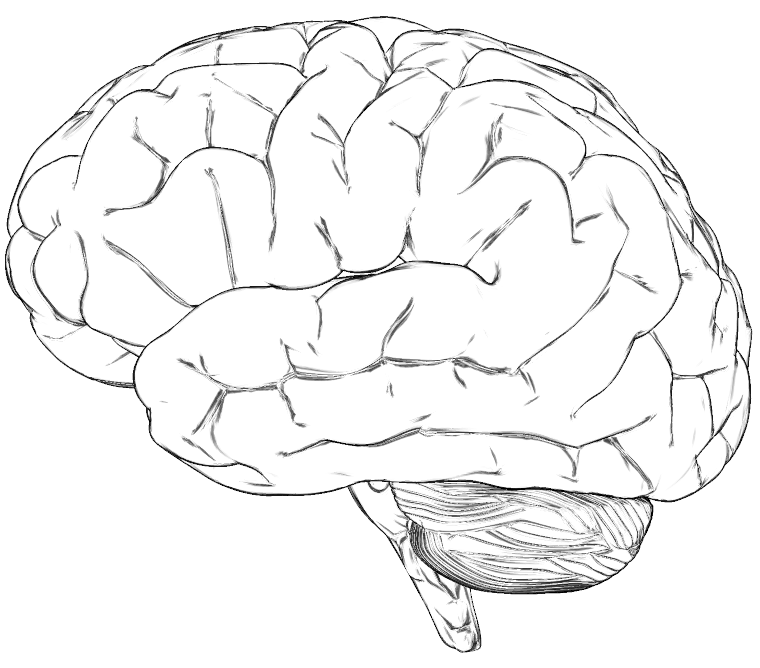 What does your brain sound like? Does it sound like “Rise of the Valkyrie” or more like “Hit me baby one more time”? Delta waves: Deepest stages of sleep. Alpha waves: Relaxation and meditation (creativity). Theta waves: REM sleep (dreams). Gamma waves: Hyper-alertness, perception, and integration of sensory input. I am using a EEG machine brought from Neurosky which is rated as Research grade (whatever that means). This measures voltage fluctuations resulting from ionic current flows within the neurons of the brain. While EEG machines are not the most accurate they are now reasonably cheap. 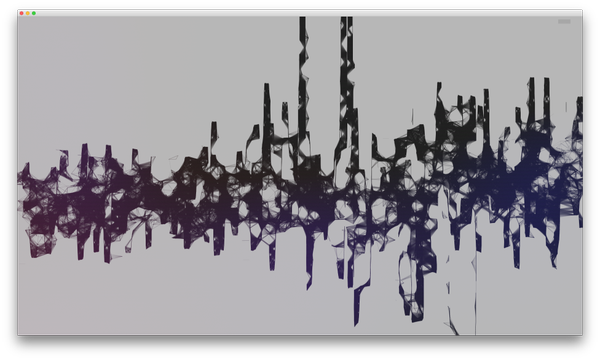 In order to generate music I want to import the EEG brainwave data into Overtone. We interact with the EEG machine over a serial port. The most mature library for this interface is in Python so there is a little jiggery pokery to get the data into Overtone. We use https://github.com/akloster/python-mindwave to interface with the EEG machines data. Writing all the data out to a FIFO file file as json. Reading from the FIFO file is simple in Clojure. We will focus on the beta-waves for simplicity. Beta-waves fall between 16.5–20Hz. We need to map a signal within 16.5-20Hz into the musical pitches of a sampled piano (21-108 pitches). Would you like to hear my brain? The results, please listen to my brain. Not really music is it? With beta-waves we get a serious of high to low transitions. While we can control at what pitch the transitions occur by performing activities that shape our brain waves the transitions don’t provide the order or structure we need to recognize this as music. The only logical path left is to try and control Dubstep with our brain. Rather than generative music we can use our brain waves to control the tempo and volume of existing synthesized music. We again have to linearise the beta wave signal to the range of volume 0.0-1.1 and to the bpm 0-400. Now all thats left to do is connect it to our brain. Mapping brain waves into live music is a challenging task and while we can control music through an EEG machine that control is hard since we are using the brain to do many other things. What is interesting in the path of this experiment is not in fact the music generated but the use of sound to provide a way to hear the differences in datasets. Hearing the difference between play Go or sleeping, between young people or old people. Sound as a means of discovering patterns is a largely untapped source.